....HOW ADVERTISING SPOILED ME....: Ambush marketing at its best! Thank you Eklavya for sending me this interesting piece of communication which was found in Mumbai, India. Jet Airways, one of the leading Airways in India anoounced to their customers that they have changed. 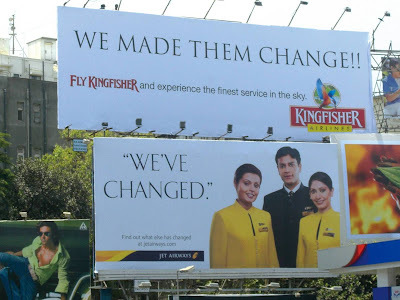 Kingfisher Airlines, on top of it whipped them by saying "We made them change". isn't kingfisher an Indian beer brand? how many other brands called kingfisher are there in India? What's the significance of the bird? Is it like England and lions, or Nigeria and Eagles? Hehehe, very funny. I wonder what they think of that?. There is a later picture, where another airline (dont remember which one) which says something like, "We are still the same! The best way to fly!" Humorous advertising is certainly refreshing in the face of all the fear mongering we see in the selling of products and services. Ha Ha Buy!! I like to investigate how such advertising is received by consumers. For example, see how optimists and pessimists receive such ads. Only the first two are actually real though... the others on top are very obvious photoshopping! Still a great billboard though. Ambushing happens all the time. It’s not going to stop; even if laws are passed. It’s unfortunate for those who are ambushed and generally works out well for the ambushers! A third billboard was put up by another Airline that said something to effect of they never needed to change because they are better than the other 2 companies below them! Read Ambush Marketing Toolkit by Kim Skildum-Reid and learn how it works for both sponsors and ambushers.